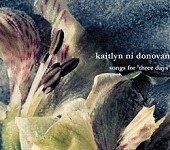 Songs for 'Three Days' is a quiet, sparse album that is centered around Kaitlyn Ni Donovan's angelic voice. Like the music, her voice is sparse and spread out, using space, time, and air to elaborate and fill in what she is trying to accomplish. With an airy lo-fi quality to it, the blossoming pop music she creates is that much more significant, leaving you with feelings of possibilities and hope. The light acoustic guitars float through the songs, giving her voice room to strut or ponder, while the rhythm section falls like little rain drops on the music, taking enough space to make an impact, but leaving enough room for her voice to take front stage. This is a lo-fi, singer-songwriter pop album that goes beyond the two categories, creating something new by blending the two. I'll give it an A-.